It is almost Spring. And as such we’ve sought new Berlin fiction, tall tales, whispered and woven, as a tonic for the wind-weathered soul. Variations on a theme, of quiet and disquiet; or rather syncretic prose & poetry, one unlike the other. Memory is a recurring theme in this release. As is identity. The two ever-fluid terms, the ripples of the former, wave after wave flooding the present, often determine the latter. 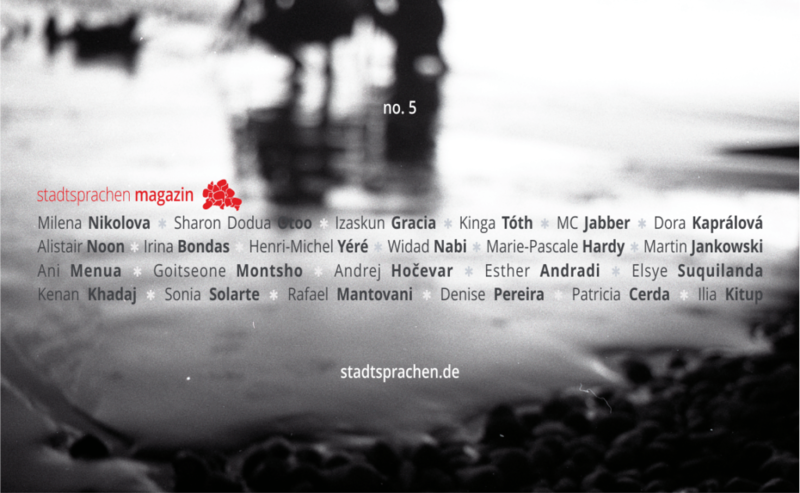 Many of our authors and poets exist between spheres and languages, and as writing is a form of self-determination, their prose & poetry is irrevocably informed by this fact and thus, in turn, colours the virtual pages of stadtsprachen no 5, one year onward from this magazines initial release. Ilia Kitup: Gibt’s Leben auf dem Mars? Sonia Solarte: Tödliche Handlungen. Zweiter Aufzug.